I’ve never even met her. At least not in person. The daughter of my close friend is engaged to be married and we couldn’t be more thrilled. But I was sort of stuck and could only think of all the little things. Those tiny moments that go so far into making up a loving marriage. A lifetime of love and joy. Those small treasures that remain long after the wedding day. So beloved bride – whether you’re newly married or not so much – here is a gift for you. Nothing grand or fancy. 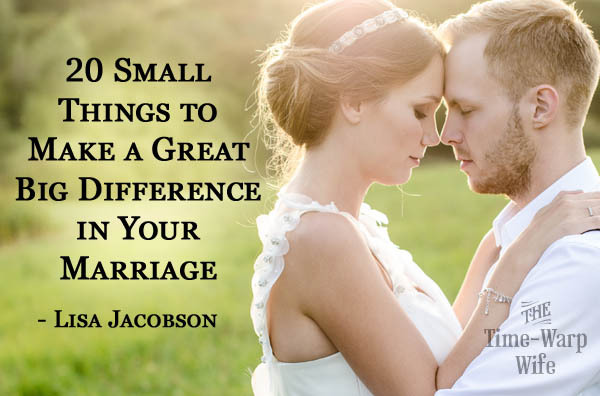 Just a few small things that can a make a great big difference in your marriage…. So blessings on you, my dear. I pray that the Lord fills your marriage with a strong sense of His presence, purpose, and joy. That your love for each other will be deep and abiding. That together you will be a bright light to a dark world who so desperately looks for that kind of true love. P.S. This list is also available as a free printable: 20 Small Things to Make a Big Difference in Your Marriage. Thanks for refreshing my soul today, Lisa! Love that you stick to God’s word! These small tips REALLY do work! I’ve been married and divorced twice. God brought me and my current husband together at a time we needed love and support. I thank God everyday for this amazing man I get to share the rest of my life with. Being kind and loving him as God intended brings me great joy. This is beautiful. We have only been married for two years and this is such a great reminder. With tears in my eyes I am encouraged to continue to pursue and love my husband as Christ would desire me to. Thank you for this! I will pass it on to many! I have been married almost 21 years to my most wonderful husband! These work! How can you forgive fully when it keeps happening again and again? I heard a great saying once, “Resentment is like drinking poison. We do it, because we think it will hurt the other person, but it actually only hurts us.” God commands forgiveness for your benefit, not theirs. Forgive fully & keep praying for your spouse and I guarantee God will speak to their heart. Your spouse has the option to do what is right. If they decide not to, God will still find you in covenant and he WILL bless you, regardless. wonderful! Soooo true! Thank you for teaching me the godly way to love my husband. I wanted to thank you for posting this. Marriage is so important and talking about how to improve it is great and I am glad that are doing so. I agreed with most of the things in this list and thought they were really good pieces of advice. I decided to have a discussion with my dad about #6 on the list, and it was a really good discussion. 🙂 🙂 I posted my thoughts on facebook, and I hope it will bring more discussion. I want to apologize for the critical nature of my post, my intent is not to criticize, but to analytically reflect on ideas. I’m trying to be more honest in my life and talk about my thoughts and feelings, and this was a great tool in helping me do that. I really don’t mean anything personal towards you in the things I said, my sincerest apologies for any offense taken, my analysis of ideas is rather blunt and I’m sorry. Best regards. When you feel annoyed (which is another word for resentful anger) at someone’s actions or lack thereof, don’t classify it as “big” or “small” – and then decide that the “small” things are not worth discussing with your partner. What you are REALLY doing to yourself is giving convincing yourself that YOU are “small” and your feelings are not worth discussing with your partner. After days, weeks and years of convincing yourself that you are small and your feelings don’t matter – you’ve got a big problem when something “big” comes up – you feel like a deer in the headlights. Out of habit, you will work hard to convince yourself that this big annoyance isn’t really big at all, it’s actually just a small annoyance that you are overreacting to. Since you’re feelings aren’t important, and you’ve never even talked about the small annoyances, why start now? You don’t even know how to start! It’s best just to keep things they way they are than to rock the boat and bother your partner with this little thing that doesn’t even matter…YOU!. Let’s be honest – “Shrugging off small annoyances and letting them bounce off you” just isn’t humanly possible. No one forgets small annoyances – resentful anger is what is really is and it just keeps building up. Resentful anger is relationship cancer. They only way to cure it is to bring it into the light and talk about it. If you don’t talk about it, your relationship is doomed to be chronically sick or die. The solution? Instead of classifying things that bother or annoy you as “big” or “small”, just acknowledge that it annoys you and for the sake of keeping resentment out of your relationship, make a promise to yourself to talk about it with your partner and about them doing the same with you – talk about resentment and talk about the importance of your relationship. #13, ‘laugh at every joke, even the one’s you’ve heard before” – is kind of related to #6. Whereas the other one was to not express the emotion you have, this one is saying to express emotions you don’t have. Be true to yourself and relate to your partner from a place of honesty. Laughing can be a voluntary or involuntary response, sometimes we can’t help it, and sometimes we can fake a “haha”. As a general rule, be genuine with your partner, don’t be fake. It’s better to say “that’s funny” if you think it’s funny but you’ve heard it before. If the joke is offensive or improper or annoying in any way, laughing just because your partner says it is wrong – so tell them! Don’t #6! This is a actually a wonderful gift idea. The gift of wisdom is one of the most valuable gifts you can give someone. I have to agree with your long list of tips. I feel that your Step Away Together is one of the best bits of advice you can give them. A couple that doesn’t make time for each other tends to forget why they fell in love with each other to start with all to easily. Thank you so much for posting this! I’m reminded today just how blessed I am to have such a wondeful husband, even if he drives me a little crazy sometimes. 🙂 He is also a great father and that is definitely a rare find these days. Wonderful post and ideas! Just coming across your blog and look forward to following! How do you overcome the hurt that a husband has caused? What if he just doesn’t seem to care about you, your feelings, or spending time with you or the children you have together? It’s very disheartening. I’m very discouraged. These suggestions seem wonderful…but what if your husband doesn’t even notice or seems not to care at all about anything you do? Not all husbands are wonderful, Christian, head of the household men. Diana, all circumstances are different. So while many things may work for one marriage, for others they don’t. My main concern here is that you are discouraged. My heart goes out to you. I pray that God will send you encouragement. If you’re not already, I hope that you can get connected with a group of women who will pray with you and listen to you. People that you can share your heart with and are able to give you wise encouragement. If not. Maybe you will consider stepping into a pastor’s office and sharing your burden? I’ve done that myself and I was really surprised at how much wisdom and encouragement he was able to breathe into my life. They are called to shepherd people like you and I. A good pastor will be able to guide you in wisdom and offer you long-term encouragement.